Through the introduction of mobile technology, the world of marketing was flipped upside down. We created an interactive report showcasing the influence of mobile tech, while showing a glimpse of the future. 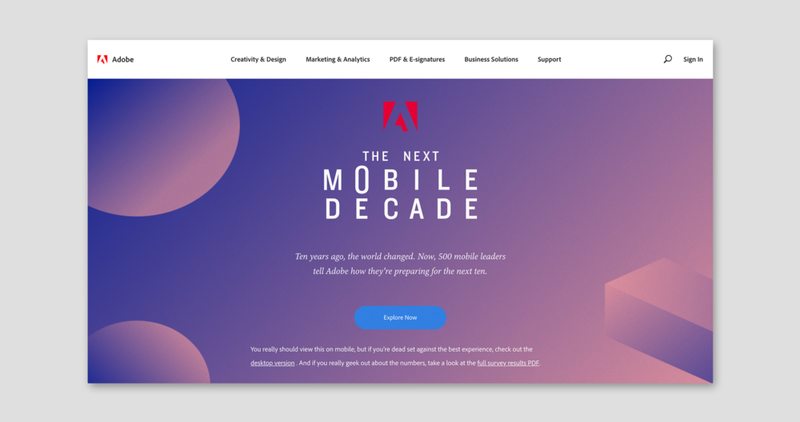 Adobe asked us to create a web experience targeted towards their Marketing and IT clients documenting their research on the influence of mobile technology over the past decade, and how it could change the marketing world in the future. Keeping our target audience in mind– a data driven crowd interested in fast, flashy information– we developed a primarily mobile experience designed to document the past then years while showcasing the possibilities of the future. With the goal of simulating the ultimate trend of future technology, machine learning, we designed a pre-report experience for mobile users where they are asked to complete three short exercises, each outcome optimizing the report special to them. In the first exercise, users take advantage of their phones gyroscope tilting the phone to select Marketing or Information Technology as their area of interest. Based on their selection, the data presented in the report is focused on their field. In the second, they are asked to interact with an abstract shape. 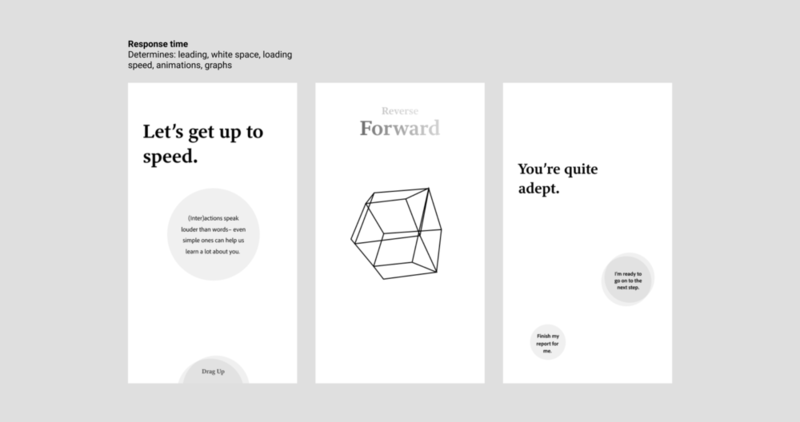 Based on the time it takes for users to reach a certain amount of taps, the machine sorts them into a fast or slow reader category, in turn optimizing the size and spacing of the typography for their reading speed. In the third exercise users can use faux augmented reality to select an orb reflecting their mood, influencing the color scheme of the report. If mobile users choose to skip the customization experience the machine makes the assumption they are in a rush and they are given the option to view a condensed version of the report. If they’re in the report and want to change it, they can access the exercises from the menu and continue to manipulate the settings. As I’m sure you’ve already assumed, our dev team was over our antics by the end of the project– but they still nailed it! After the concept development stage, my main role was to design the layout of the report itself. Knowing we wanted to encourage users to view the report on their phones, I was given the challenge of manipulating a 40 page report into a good mobile experience. I began approaching the layout in a screen by screen way, however by working with the copywriters to create a summarized version, breaking the information into "chapters," and turning the data into interactive points I was able to avoid the monotony of an endless scrolling page as well as create an easily digestible experience. I took a first pass at visual & data design, then passed it off to Kal, our senior designer, to do the final design. Since the report was focused on the future of mobile technology we optimized the experience to work on a mobile device. However, not wanting to withhold data from our audience I was responsible for creating the desktop experience. 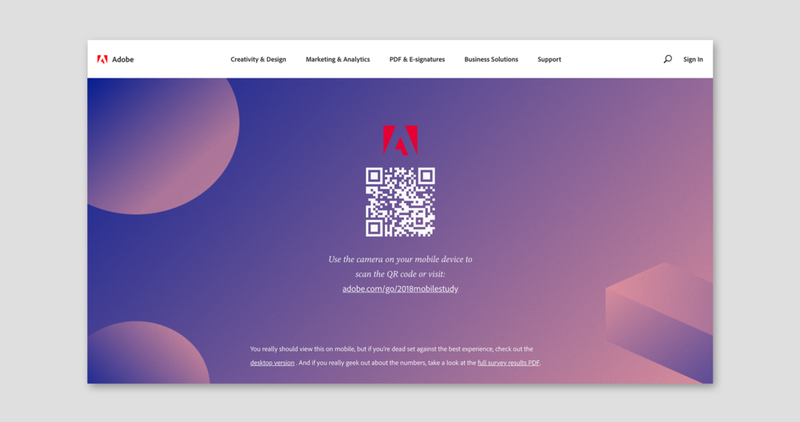 The desktop experience begins with a landing page pushing users to a QR code they can scan to open the site on their phone. If they choose to proceed on desktop they are taken to the full version of the report with only the option to customize the emphasized industry.